The lights and sirens down Felix Street, escorted by helicopter on Friday, were a powerful show of support for a grieving Fort Worth police widow. “It's overwhelming and it's beautiful,” said Sabrina Hull. It's been nearly seven months since Corporal Garrett Hull, a father of two, died while working undercover. He was shot in pursuit of three men who tried to rob the Los Vaqueros sports bar last September. “We miss everything. There isn't anything we don't miss about Garrett,” she said. Hull is one of 14 fallen officers being recognized across the country this week by Cannonball Memorial Run. 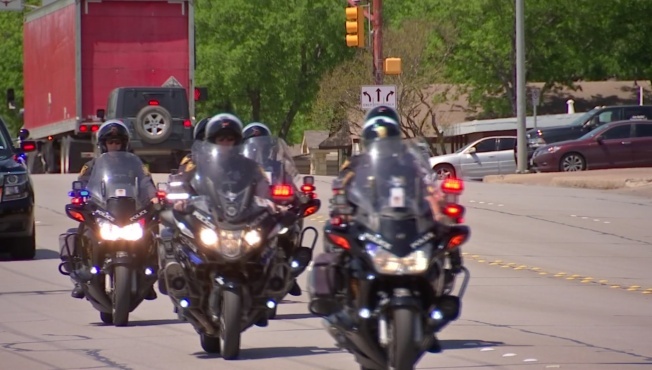 The group, made up of law enforcement, is traveling from California to Washington D.C. to bring awareness to those targeted for wearing a badge. Hendrix is with the San Bernardino County Sheriff’s Office. He said each stop carries special meaning because 23 years ago, he was shot in the line of duty too. “I was tearing up there on the stage because of the emotions that I feel. We're people too,” he said. The group is driving from state to state, presenting plaques and collecting patches they plan to give to the U.S. Attorney General in the nation's capital on Monday. It's a gesture that means the world to Sabrina Hull. She said her girls have been warriors like their father, but she's glad to know they're not fighting alone. “They're representing all of our voices, you know. They're saying hey we have to stand together and we have to fight against this and we need to let the public know, don't forget these officers, don't forget these heroes,” she said. Cannonball Memorial Run was created in December 2016. Organizers said it was inspired in part by the Dallas police ambush that took the lives of four DPD officers and a DART officer that July. The caravan also made a stop by the Dallas police station Friday afternoon, to pick up a patch for Officer Rogelio Santander. The 27-year-old was shot and killed while trying to arrest a shoplifting suspect at Home Depot a year ago this month. The non-profit also provides financial assistance to families of fallen officers. If you’d like to learn more about Cannonball Memorial Run or donate to the cause, click the link. You can also track the group's adventures on Facebook.